Last month, IMF lowered its global economic growth forecast for this year from 3.7 to 3.5 per cent. The International Monetary Fund governments to gear up for a possible economic storm as growth undershoots expectations. “The bottom-line -- we see an economy that is growing more slowly than we had anticipated,” IMF Managing Director Christine Lagarde told the World Government Summit in Dubai. 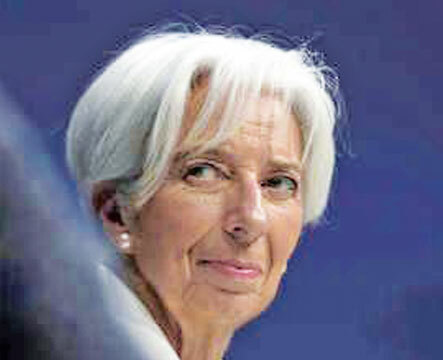 Last month, the IMF lowered its global economic growth forecast for this year from 3.7 per cent to 3.5 per cent. Lagarde cited what she called “four clouds” as the main factors undermining the global economy and warned that a “storm” might strike. Lagarde said trade tensions -- mainly in the shape of a tariff spat between the United States and China, the world’s two biggest economies -- are already having a global impact. “We have no idea how it is going to pan out and what we know is that it is already beginning to have an effect on trade, on confidence and on markets,” she said, warning governments to avoid protectionism. Lagarde also pointed to the risks posed by rising borrowing costs within a context of “heavy debt” racked up by governments, firms and households. “When there are too many clouds, it takes one lightning (bolt) to start the storm,” she said.